Ready for a new roof? Shingles protect your home's roof and add to the curb appeal, but there's more to shingles than looks. Understanding the different shingle options helps you weigh the pros and cons of each to find a type that fits your needs. Asphalt tops the list of shingle types in terms of popularity, mainly because of the affordable price point. They're made of asphalt, but they also have another material to reinforce it, which is often fiberglass. Asphalt shingles come in two main styles: Three-tab and architectural. Three-tab shingles feature a thinner profile with a single layer and cutouts on the bottom edge to look like three separate shingles. Architectural shingles feature multiple layers to create a thicker dimensional look. Asphalt shingles are relatively lightweight and easy to install, so homeowners can handle the installation themselves. And they're waterproof, fireproof and resilient to offer good protection for your roof. They can last 20 to 30 years or longer. But asphalt shingles don't hold up well in high winds or in areas where the temperature fluctuates suddenly. They're also not ideal on roofs with low slopes. Wood offers a distinct earthy look on your roof. These shingles are usually made of either cedar or redwood. You'll spend more on wood than you would on asphalt, but they're more affordable than some other roofing materials. Wood shingles are energy-efficient, eco-friendly and hold up well. They may last as long as 30 to 50 years. And when you do have to replace them, the wood can be recycled. Wood shingles require regular maintenance to prevent damage. If wood shingles do get damaged, you usually need to replace the shingle instead of repairing it. It can be challenging to get the new wood shingles to match the old ones. And, since they're made of wood, they catch on fire easily. Check with the fire codes in your area to make sure wood shingles are allowed. Mold and termite damage are also possibilities with wood shingles. If you prefer the natural look of stone, slate shingles may be the solution for your roof. Like wood, slate is an environmentally friendly option. It can also help maintain the temperature inside your home, which can help with your utility bills. One of the biggest advantages of slate shingles is the longevity. They can last 80 to 100 years or longer if you take care of them well. 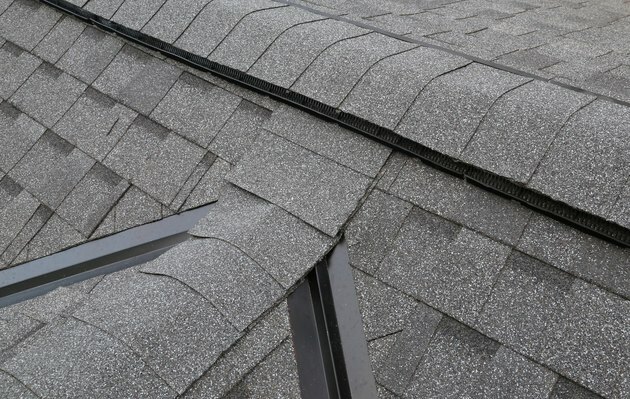 Slate shingles hold up well against wind, hail, heat and moisture with a low risk of leaks. They also hold up well in snowy climates. Slate comes with some potential drawbacks, though. The weight of slate is a problem in some cases. Your roof needs to be able to withstand the heavy slate tiles. You'll also spend significantly more on slate tiles than you would on other materials. Repairs can be expensive if any of the slate shingles get damaged. Because they're so heavy, slate shingles typically aren't a do-it-yourself job. You'll need to hire a roofer with experience installing slate to make sure the installation is correct. Composite shingles feature a variety of material options, including plastic, polymer and rubber. These shingles give you lots of options because they're made to replicate the look of other materials. So you can get the look of materials, such as wood or slate, in a lighter material that may hold up better. You can also choose from a variety of colors. Composite shingles can last 50 years or more. They hold their color well, so they won't look faded or old over time. The materials used in these shingles make them resistant to heat and impact. And some composite shingles feature additives for additional protection against environmental factors, such as moss and UV rays. Lower quality composite shingles are more likely to absorb water, which can lead to damage in areas that freeze. Even though the shingles look like the inspiration material, they often lack the insulating power of the original. They also don't tend to last as long as the original when it comes to material, such as slate. Since it's a newer material option, not all roofers have experience installing composite shingles. Clay and concrete tiles bring to mind Southwest or Spanish-inspired homes. They often have a curved or scalloped design. Because it's noncombustible and resists fading, clay is a durable roofing option. Concrete offers a similar look, plus it reflects sunlight and works as a good insulator. These tile shingles usually last about 40 to 50 years, so you get a lot of life out of them. You may also be able to repair minor damage with roofing cement on your own. One drawback of clay or concrete tiles is the brittle nature of the material. They hold up well against weather elements, but they can crack with sudden impact. This shingle type is also very heavy, which means your structure may not be able to handle the weight. Installation is challenging, so you'll need to hire a professional with experience in tile shingles to get it right. This is also an expensive roofing option. The shingle type you choose depends largely on your budget, but the aesthetics of each type is also a factor. In the case of heavier materials, the structural integrity of your home comes into play. Compare the options fully before investing in your new roof. What Is a Composition Shingle Roof?